Taking such popular heartburn drugs as Nexium, Prevacid or Prilosec for a year or more can raise the risk of a broken hip markedly in people over 50, a large study in Britain found. The study raises questions about the safety of some of the most widely used and heavily promoted prescription drugs on the market, taken by millions of people. The researchers speculated that when the drugs reduce acid in the stomach, they also make it more difficult for the body to absorb bone-building calcium. That can lead to weaker bones and fractures. Hip fractures in the elderly often lead to life-threatening complications. As a result, doctors should make sure patients have good reason to stay on heartburn drugs long term, said study co-author Dr. Yu-Xiao Yang of the University of Pennsylvania School of Medicine. "The general perception is they are relatively harmless," Yang said. "They often are used without a clear or justified indication for the treatment." Some people find relief from heartburn with over-the-counter antacids such as Tums, Rolaids and Maalox. But for others, those medicines do not work well. 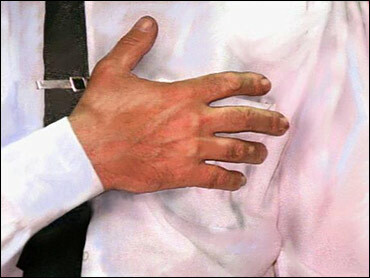 Moreover, heartburn can be more than a source of discomfort. People with chronic heartburn can develop painful ulcers in the esophagus, and in rare cases, some can end up with damage that can lead to esophageal cancer. Dr. Sandra Dial of McGill University in Montreal, who was not involved in the study but has done similar research, said patients should discuss the risks and benefits with their doctors and taper off their use of these medicines if they can. Nexium, Prevacid and Prilosec are members of a class of drugs known as proton pump inhibitors. The study found a similar but smaller risk of hip fractures for another class of acid-fighting drugs called H2 blockers. Those drugs include Tagamet and Pepcid. The study, published in Wednesday's Journal of the American Medical Association, looked at medical records of more than 145,000 patients in England, where a large electronic database of records is available for research. The average age of the patients was 77. The patients who used proton pump inhibitors for more than a year had a 44 percent higher risk of hip fracture than nonusers. The longer the patients took the drugs, the higher their risk. The biggest risk was seen in people who took high doses of the drugs for more than a year. That group had a 2 1/2 times greater risk of hip fractures than nonusers. Yang said that for every 1,262 elderly patients treated with the drugs for more than a year, there would be one additional hip fracture a year attributable to the drugs. For every 336 elderly patients treated for more than a year with high doses, there would be one extra hip fracture a year attributable to the drugs. Dr. Doug Levine of AstraZeneca PLC, which makes Nexium and Prilosec, said the study does not prove that proton pump inhibitors cause hip fractures. It merely suggests a potential association, he said. Doctors need to monitor their patients for proper dosage and watch how long they take the drugs, Levine said. Julia Ellwanger, a spokeswoman for TAP Pharmaceutical Products Inc., which markets Prevacid, said proton pump inhibitors' safety has been well-established by rigorous studies, and the new study does not prove or disprove a connection to hip fractures. Dr. Alan Buchman of Northwestern University, who was not involved in the research, said the study should not change medical practice, since doctors already should be monitoring the bone density of elderly people taking the drugs and recommending calcium-rich diets to all patients. "Most people are not taking enough calcium to start with," he said. He also wondered if a similar result would have been found in a sunny climate, because vitamin D from sunshine helps with calcium absorption. Also, Buchman said it not known whether the acid-fighting drugs prevent esophageal cancer. He said the risk of esophageal cancer has been exaggerated in the marketing of these drugs. "I think the risk has been overplayed and scared the community," Buchman said. Dr. David Pura of the University of Virginia Medical Center has also studied acid reflux medications. He, too, says the benefits of them still outweigh the risks, CBS News correspondent Michelle Miller reports. "I will counsel my patients that it is important that they eat a nutritious diet and that they continue to take these medications because they are suffering from symptoms that affect their quality of life," Dr. Pura told CBS News. Heartburn medicines are heavily are advertised in "Ask your doctor about ..." commercials in this country, particularly during the evening news. Nexium is the third biggest selling drug in the world, behind the cholesterol medicine Lipitor and blood thinner Plavix, with global sales totaling $5.7 billion last year, according to IMS Health, which tracks drug sales. Yang and his co-authors disclosed in the paper that they have worked as consultants and received speaking fees from companies making acid-fighting drugs. The study was funded by the National Institutes of Health and the American Gastroenterological Association/GlaxoSmithKline Glaxo Institute for Digestive Health. Men in the study had a higher drug-associated risk of hip fracture than women, possibly because women may be more aware of osteoporosis and may get more calcium in their diets, Yang said. He plans more research on whether calcium-rich diets or calcium supplements can prevent the problem.